Stained glass in Los Angeles Acottish Rite Temple. I spent some time last weekend visiting the Marciano Art Foundation (and gallery) in Los Angeles. It is an amazing space with near limitless potential almost in the heart of the city of angels. What makes the space relevant to Freemasons is that the space that the Foundation Galley occupies was once the jewel of modern Freemasonry as the Los Angeles Scottish Rite Cathedral. 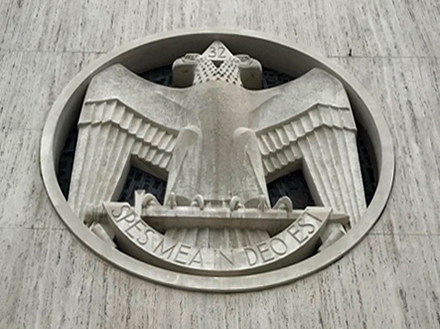 the Double Headed Eagle of the Scottish Rite. …I was surprised by the tremendous number of things that had to be incorporated in this temple. First of all, the upper degrees of [Scottish Rite] Masonry are given in an auditorium, and they are given in the form of plays. They have incredible costumes and magnificent productions of the basic concepts that are ethical and have at heart a religious depth, and they draw from many religions, as far as I understand. I’m not a Mason, but I do feel that it’s a tremendous attempt toward the freedom of man as an individual, and the rights of man as an individual, and respect for various races and creeds. I won’t say this is always obtained, but certainly, that’s been the spirit. They felt that they wanted to depict this in every form. The huge mosaic on the exterior east end of the temple at that time was the largest mosaic I’d ever made. It starts out with the builders of the temple from the days of Jerusalem, and King Solomon, who built the temple, and Babylon. Then it jumps up to the Persian emperor, Zerubbabel. When the Crusaders went to the Holy Land, they built a place called Acre, which is still a very important historical monument to the period of the crusaders. Of course, there were other temples and I showed Rheims cathedral in the process of building. I showed the importance of [Giuseppe] Garibaldi, the Mason who broke away from the Roman Catholic church because of what he felt was its limitations and dogmatism. Ever since then, there’s been a certain quarrel, I gather, between the Masons and the Catholics. Then there is King Edward VII in his Masonic regalia as one of the great grandmasters. We had the changing of the guard at Buckingham Palace, which is part of the King Edward section. I think the final part of that mosaic shows the first grand master of California in his full regalia being invested in Sacramento. It’s a kind of historical thing going way back to the ancient temple builders and coming right up through to actual California history, which the California sun at the top symbolizes. 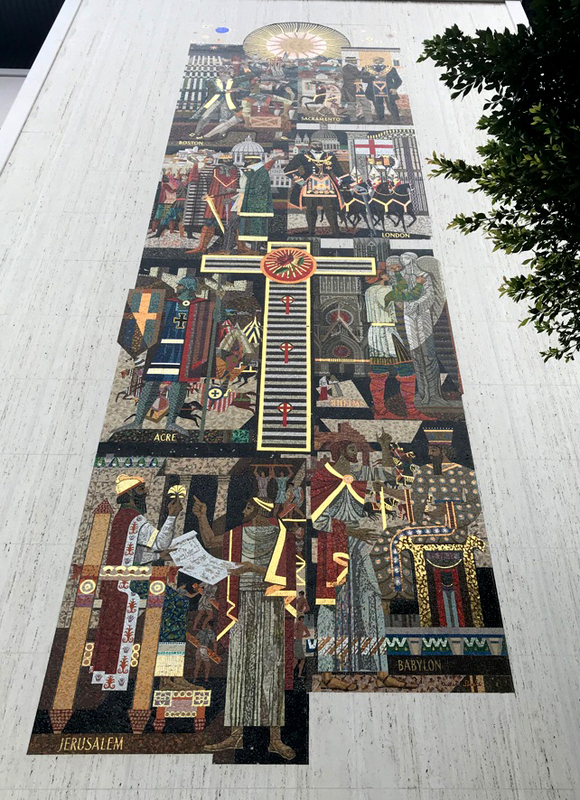 Millard Sheets History of Freemasonry mosaic in Los Angeles. The mural he surmises represents that law and concepts of religion were involved in the great temples. Certainly, the Gothic cathedrals were the book for the people who couldn’t read. Well, they didn’t think of the American people not being able to read, but they wanted to show graphically the intensity of feeling throughout history toward the Meaning of Masonry. In like manner, Sheets worked with sculptor Albert Stewart to adorn the master builders of history along the edifice. The work and consideration alone that went into the temple might well be enough to say it was a great asset and jewel in the crown of Freemasonry. But like all crowns, they tarnish with time and often fall from the heads of the kings they once adorned. By 1994, the Scottish Rite Temple in Los Angeles was all but abandoned. The Los Angeles Conservancy says of the space that it was the result of “years of declining membership” that the temple was vacated. And yet, this modern imposing temple fell into ruin. After abandoning the temple it sat nearly empty save for a few unremarkable semi-urban businesses in the ground floor foyer. I remember that time, passing the building in awe at its grandiose presence and bewildered at the neon atm sign unintelligently fixed to its entryway. By all accounts, it could have been a Roman ruin in a landscape that had moved on and forgotten it. Foyer at the Marciano Art Foundation. Upon visiting, my first impression was that space is remarkable. Entering from the garage and walking through the foyer, it was impossible to not feel the energy of what it had been constructed for. Indeed, I had entered hallowed ground. It still felt like a once great Scottish Rite Hall. Standing at point, in the near pitch blackness of what was once the theater space, now the art installation of Olafur Eliasson’s Reality projector, I felt compelled to give the signs of the degrees — there, by my self, for the ghosts of the past to see that a brother had come to visit. Perhaps it was at this point that a deep feeling of sadness began to stir. That feeling stayed with me while I looked at the art. But, that stirring became a tempest of emotion when on the last stop in the space, in a small red-carpeted room in the north-west corner of the building. There, in the small ‘room’ sat the “artifacts” left by the “Masons who abandoned the building.” I use quotes here as these were the words used by the docent stationed in the space to tell interested visitors what the strange aprons and funny hats were. 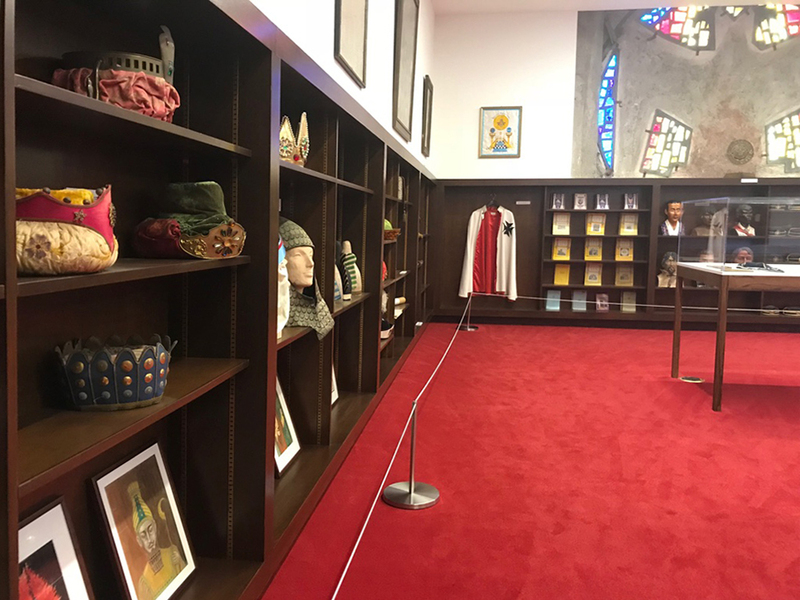 The relic room of Masonic artifacts left behind at the Marciano Art Foundation in the Old Scottish Rite in Los Angeles. I can’t say for certain if it was the space, the items in the space or the words taken in the context of the aforementioned relics of what Freemasonry once was. Leaving the relic room, I was moved to tears — not for the casual housing of materials sacred to me, but tears for what those relics once represented to the people in the space. To the owners of the history that poured the foundation and raised the marble edifice. Perhaps more so, the thought that this was the future of Freemasonry. That an empty building full of abandoned “relics” was really what lay at the end of it all. Yes, the building is just a building, but it affects the priest no less to see the church he dearly loved, laid low by a fire or an earthquake. Masons are builders and buildings can be replaced. But walking through the bones of a structure built to show the “intensity of feeling throughout history toward the Meaning of Masonry” felt like a priest walking through the ashes of his fallen church. Some of the “relics” of Freemasonry at the Marciano Art Foundation in Los Angeles. I wanted to feel optimistic about the space. I wanted to appreciate it for what it once was. Instead, I left haunted feeling depressed and overwhelmed. Not at the space or the modern art within its walls. I was haunted by the ghosts of what it once was. Sheets went on to design the San Francisco Scottish Rite Masonic Center building, a structure in perpetual use to this day. And, the Scottish Rite’s Valley of Los Angeles retains a presence meeting at the Santa Monica Masonic Center. And yet, the bones of the cathedral remain in the heart of the city. A fitting fate for the Royal Art in the city of angels. The following is some of the imagery and iconography that still adorns the old Scottish Rite in Los Angeles. George Washington masonic statue in Los Angeles. Above the entry of the Old Scottish Rite Temple in Los Angeles, now the Marciano Art Foundation Gallery. 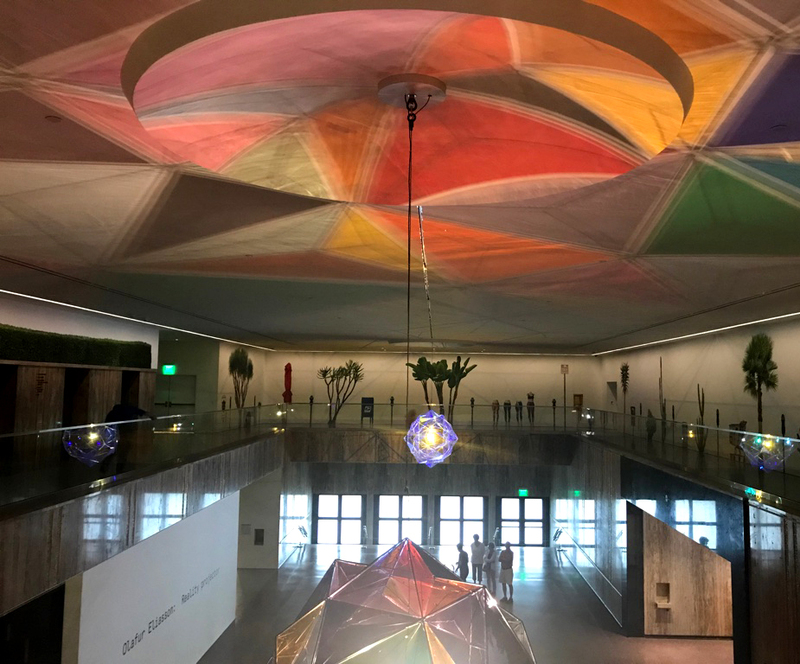 Theater space of the old Scottish Rite in Los Angeles showing Olafur Eliasson’s Reality projector installation. The art at the Marciano Art Foundation in Los Angeles. The inscription reads: Liberty: Our fathers brought forth a new nation conceived in liberty. Fraternity: Behold how good and how pleasent it is for brethren to dwell together in unity. Equality: We hold these truths to be selfevident that all men are created equally. Devotion: Masonry Builds its temples among the nations in the hearts of men of good will. Large Bronze Square and Compass on the old Scottish Rite elevator doors. You can read more on the theme of a priest for Freemasonry in the book, The Master Mason. Possibly the most poignant commentary I’ve read in a very long time, and summarizes the way I feel every time one of these temples is thrown away by the fraternity. Thank you, Greg, for writing this.